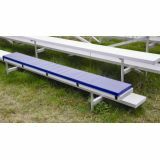 Create comfortable seating for your players or spectators. Simply buckle the straps under the plank for installation. Pads are 7'L x 10"W x 1-3/8" thick. Designed for 7-1/2', 15' (requires 2 pads) or 21' (requires 3 pads) planks. Please specify color when ordering.